Vancouver is often considered an unaffordable place to live. As of December, the benchmark price for a detached single-family home was $1,002,200, up 8.1 per cent from the year before. Faced with such steep housing costs, people like Feenstra have started seeking alternative, mortgage-free paths to home ownership. Affordability is just one factor. Just as Feenstra is willing to give up space inside her home in exchange for more ready access to nature, and the freedom to travel, her urban counterparts are willing to sacrifice private space so that they can live a short distance from both work and play. People living in the City of Vancouver’s recently legalized micro suites are already reaping the benefits of urban tiny living, but so far there are only a handful of tiny houses in Metro Vancouver. It’s not for lack of interest—there is a small, but intent group of tiny house enthusiasts in the area—but there’s some red tape to cut through before tiny houses can become a viable housing model. Image courtesy of Camera Building. Tiny houses fall into a legal gray area. There is no outright ban on them. Building them is more or less the easy part. 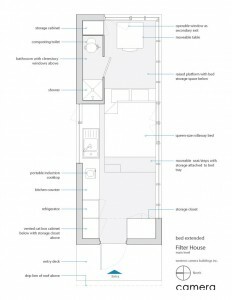 Any building with a footprint less than 107 square feet is exempt from the B.C. Building Code. A house on a trailer is not covered by the code. Instead it is registered and insured as a Ubilt trailer with ICBC. But bylaws make it almost impossible to live in one legally. In the end, it comes down to the municipality. In West Vancouver, an accessory building cannot be used as a dwelling unit. Laneway houses are permitted, but again there’s no minimum size. At the federal level, Canada’s National Building Code bans any home under 145 square feet. 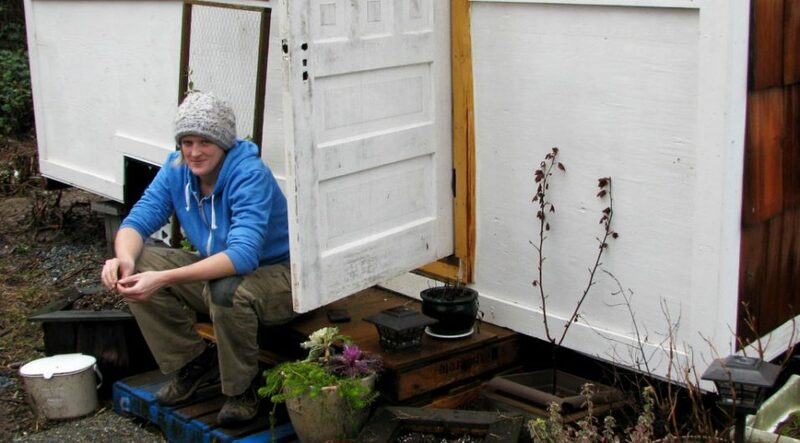 The City of Vancouver has clear rules that apply to tiny houses. “Right now if you want to build below 320 square feet, you can’t,” says Brian Jackson. “There are no bylaws in place to allow you to build below that.” There are a couple of exceptions, but none that would apply to tiny houses. 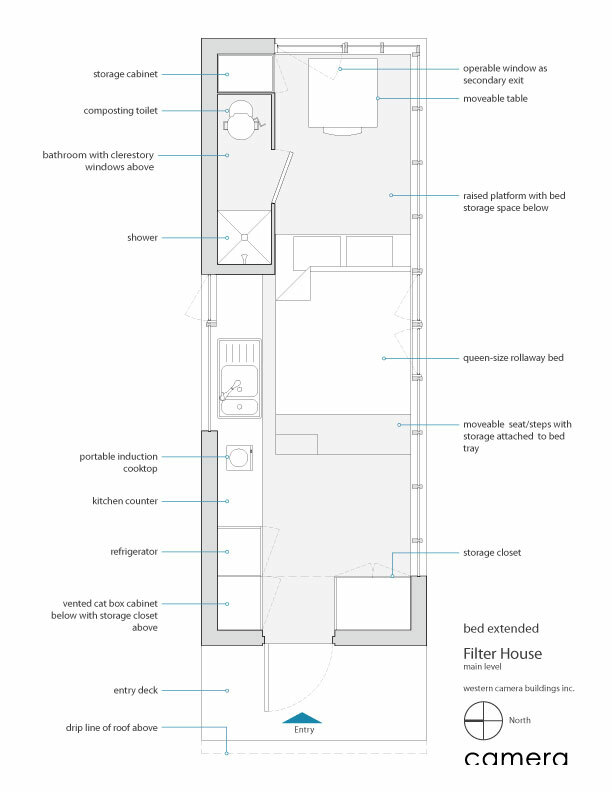 Suites for social or secured market rental housing can be as small as 320 square feet. In March 2014, council voted to lower that requirement to 250 square feet for micro suites in the Downtown Eastside. The Burns Block, a former SRO at 18 W. Hastings, is home to Vancouver’s smallest rental apartments at 226 square feet, the result of a heritage deal with the city. In West Vancouver and Vancouver, it is legal to live in a recreational vehicle, so long as it’s located in a trailer park. Though that doesn’t help Vancouver residents, since there are no trailer parks within city limits. In Abbotsford, where Kayla Feenstra and Jack live, it is illegal to live in an RV for more than 72 hours in a 30-day period. The legal limitations make it difficult for would-be tiny homeowners to find a place where they can setup house. Small Housing B.C., a society that supports and promotes sustainable small housing, recently released a series of case studies looking at ten different housing types across North America, including tiny houses. They concluded that tiny houses offer an affordable home ownership option, but that it’s hard to secure a location for one. For tiny houses to become a realistic home ownership option in Vancouver, the city would have to make it legal for people to either park their tiny houses in other people’s yards, or create tiny house villages and share the cost of land. Parking tiny houses in backyards would make them similar to laneway houses, and they could be legalized under a citywide policy similar to the one the City adopted for laneways.